Los Gemelos is a wonderful place serving Mexican food here in Port Chester. We have been frequenting Los Gemelos for the past three or so years. They have always had excellent food and is one of the go to places for bringing out of town guests. On our last visit we arrived in the early evening. I had just gotten out of work and we were both hungry and wanted something easier than going home and cooking. This is the usual mood for our visits here. Something very good and somewhat quick and certainly easy. Parking is on the street on Westchester Avenue. This is metered until 6pm on weekdays and Saturday and free on Sunday. You can also park up Pearl Street in the lot next to Neri's Bakery. They are also a very short walk from the Port Chester Metro North Railroad station. When you walk in you will see the tortilla maker on the right behind the counter and seating on your left. You have to walk all the way into the restaurant to the back to get around into the seating area. There is no wait to be seated here. Just come in and find yourself a seat. Do be aware that the booths here are quite narrow. Anyone of any size like myself or just looking for comfort will be happier in the chairs at the tables. Once seated you'll quickly be visited by one of the waitresses. They do have varying levels of English but you will not have a problem ordering your food and we have never had a bad service experience in here. The menus are in both English and Spanish and offer a rather good variety. Not being the type of place where you sit down and eat course after course, I am going to go into many of my favorite dishes here. My wife is almost always getting a Four Cheese Quesadilla. It is actually quite good and I would order it myself if it weren't so filling and would leave me unable to eat all my other favorites. 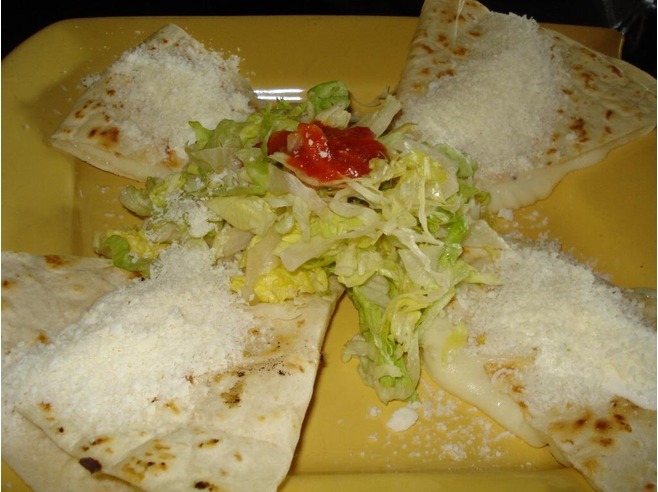 It comes with two cheeses to pour on top of the quesadilla as well. One is a creamy thin cheese that acts as the glue for the other flaky powdery cheese. My favorite dish here would be too hard to determine. It really is a mood thing for me. In the winter when I want something filling I always go with the Carnitas Burrito. 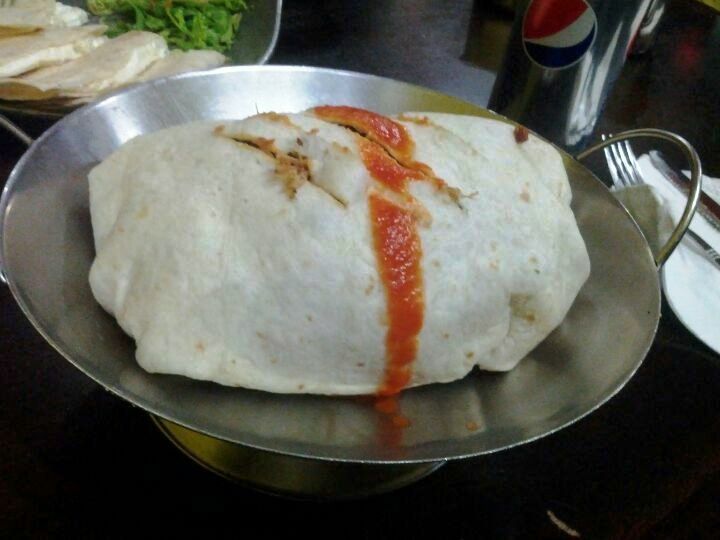 The burritos here are rather large filling the entire bowl they're served in. Another favorite of mine is the Al Pastor Torta. All the tacos here are served in a double layer of tortillas. 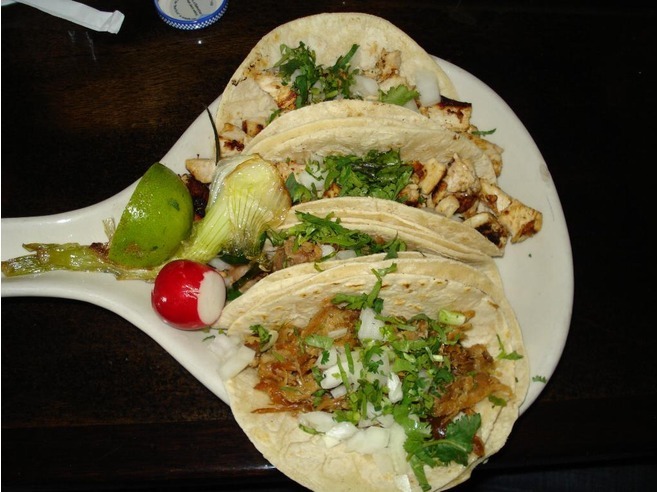 My favorites are the grilled chicken and the carnitas tacos. They are served with cilantro and onions which round out the plate. In short, you can not go wrong here with a fairly cheap and very good meal. Please note, the map below shows the marker below Pearl Street. This is actually the 2nd storefront up from Pearl, right next to Inca and Gaucho.